ARI, a kampung boy doing odd jobs after finishing school, applied to become a fireman. He said the job will give him a fixed income and help him to acquire skills, which would be useful throughout his life. He was called for an interview and had his medical examination done. Within two months, he was recruited and sent to Kuala Kubu Baru for training. Soon after, Ari got married and is now waiting for his second child. The first was a girl. But over the last couple of days, Ari has been calling me many times and sending many messages. 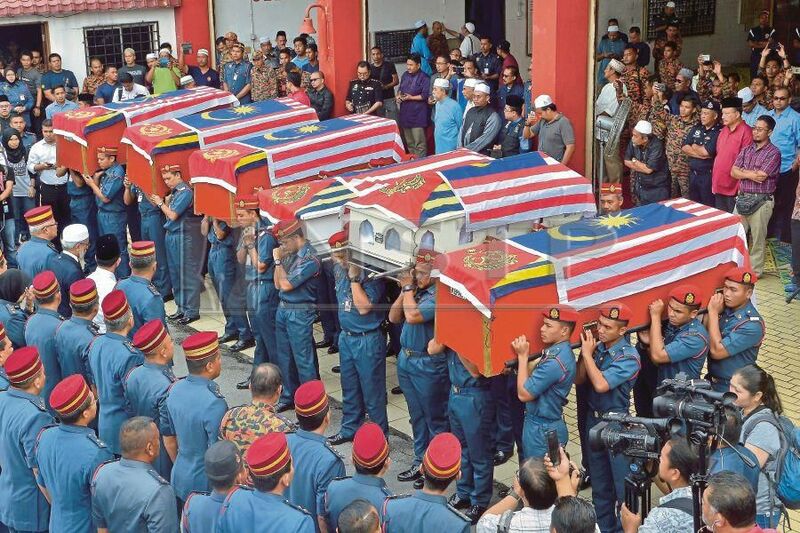 The deaths of the six firemen in that tragic search-and-rescue (SAR) mission in Puchong has really affected him. He hardly knew them, but felt a strong affinity with them as they were in the same profession. It could have been him, Ari said, sounding sad and empty. This is felt by other firemen throughout the country. Ari’s fire station in Tanjung Malim was quiet as firemen huddled and talked about their dead colleagues. The tragedy is felt by almost everyone. Social media is full of comments about the ill-fated operation, with all sorts of theories being bandied about. Overnight, many of us had become experts in SAR operations. We offer our deepest condolences to the families of the six firemen who died on Wednesday. They will be forever remembered by the nation as fallen heroes who perished while trying to locate a missing person. All of them were buried on Thursday in their hometowns. The nation is still in a state of shock as to how a seemingly routine SAR mission ended in tragedy. The missing person, Muhammad Ilham Fahmy Muhammad Azzam, 17, also drowned. His body was found on Thursday. Seven lives were lost in the old and disused mining pool. Apparently, there were other deaths at the same pool before this. Selangor Menteri Besar Amirudin Shari had ordered the mining pool to be sealed off to prevent more fatalities. One must remember that this kind of mining pool is not only huge but deep as well. Amirudin should lead a team of experts to visit the mining pool and plan an effective and practical way to seal the area. In fact, all states with similar pools should take similar steps to prevent further mishaps. Anglers normally frequent these pools over the weekends as, in some cases, fish are aplenty. Even if the pools are fenced up, such as The Mines in Sungai Besi, these anglers would find a way to drop a line and continue to enjoy a bountiful harvest. Why not lease these ponds to entrepreneurs who can turn them into an angler’s paradise? By doing so, the pool can be fenced up and be made secure. The states can earn income, entrepreneurs can make money, anglers happy and, most importantly, the pools are safe and do not become routine death traps. But back to our fallen heroes. While the families of the firemen are grieving, the efforts to investigate the tragedy must be thorough and detailed. A full account must be shared with the public. While we wait for this official probe, we must refrain from speculating too much. Even if there are experts on the matter out there, please refrain from sharing their theories and armchair investigations. It is better for them to lend their expertise (if needed) to the relevant authorities.